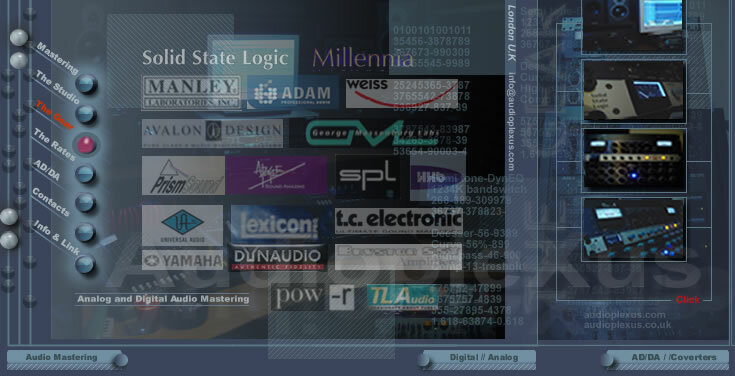 CD mastering studio,AudiopleXus-cd mastering,London UK. Solid State PRISM SOUND Maselec MEA - 2 EQ // TC ELECTRONIC MASTER 6000 processor multi I/O // WEISS EQ1LP // WEISS DS1 comp/linit // SSl X-logic G series Compressor // Alesis Master disk 9600 // HHB Burn it 830 - Plus // Alesis AES / ADAT X8 I/O FI4 // Behringer stereo denoiser // Lexicon pcm 91 // Tc Electronic M5000 // Z-Systems z8-8 // The TC M6000 include software 3.60 CD mastering MD-4-MD-3 , GML algo, Brickwall 2 limiter. Stereo to 5.1, Deesser, 5 band compressor MASSENBURG EQ, Decompressor,reverb & delay // Tc finalizer express. Full range of DD encoding for DVD and CD DTS Encoding. MANLEY Passive Passive EQ Engineers who have already gotten hold of the MASSIVE PASSIVE have told us: "Why does it make everything sound so much better? ", "It's organic and orgasmic. ", "It's a f%#king powerhouse. ", "It's unlike any other EQ. ", "This is IT. The sound I've always dreamt of but couldn't ever get until now. AVALON 747sp The opto-compressor features a minimum signal path design utilizing sealed silver relays for all signal routing and by pass functions. The optical attenuator acts as a passive level controller with a Class A, variable gain make-up amplifier. Full dynamic control from soft compression to hard-knee limiting can be achieved with master threshold, ratio-compression, attack and release controls. Gain reduction indication is a large analog VU meter. Low frequency and high frequency contour parametric spectral controls can be routed into the side-chain path for enhanced frequency dependent compression with variable frequency and threshold levels. SC listen provides side-chain listen mode for monitoring. While mastering on your PC can give good results, I certainly wouldn't claim that it gives results as good as those achieved by a professional mastering engineer. For a start, you're unlikely to have a state-of-the-art monitoring system that's flat down to 30Hz or less to accurately judge the bass end. You won't have tens of thousands of pounds worth of esoteric EQ, compression, reverb, and other goodies to tweak your sound to perfection. Most of all, however, you're unlikely to have the same level of expertise, objectivity, and impartiality. Good mastering engineers are renowned for their 'golden ears', and their skills are acquired through years of training and experience.